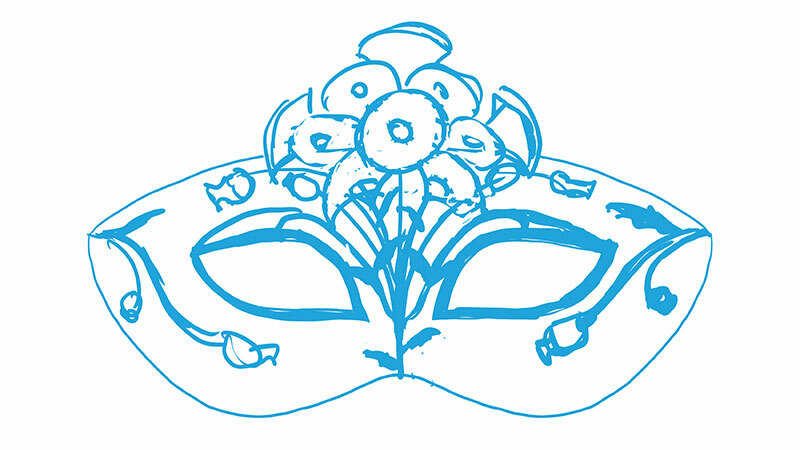 I’ve been looking forward to June’s mask for its simplistic color scheme and classical flower. The Rose birth flower combines with the Pearl birthstone promises to be a lovely color scheme which is one of my favorite color schemes, white and red. 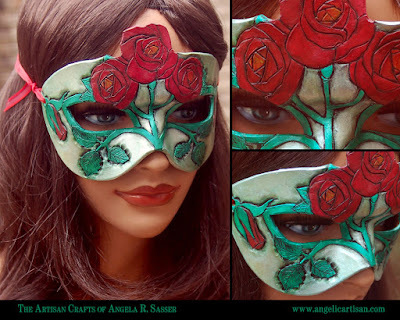 The biggest challenge with this mask was that there are a hundred ways to draw a rose. I knew from the start I wanted the large, classical petals, but should they be hyper-stylized or realistic? 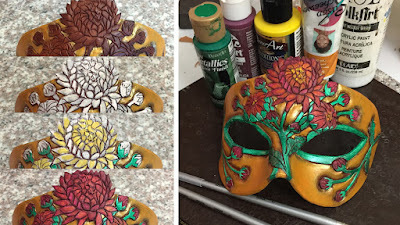 In the end, I went with something in-between stylized and realistic with an abstraction of the bloom centers to make carving easier on my hands. I also settled with a layout that allows me to focus on a good mixture of petals versus leaf texture without being too busy. 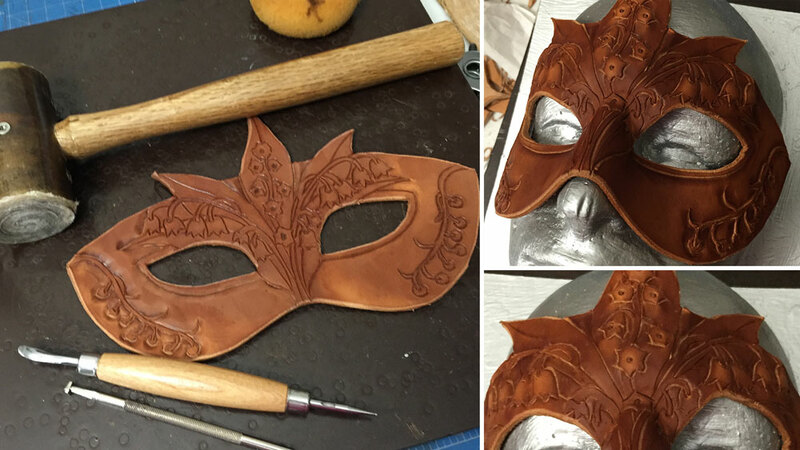 Here are a few shots of the mask before and after it was tooled and baked. Ah Lady of December! She was the painting that started it all. 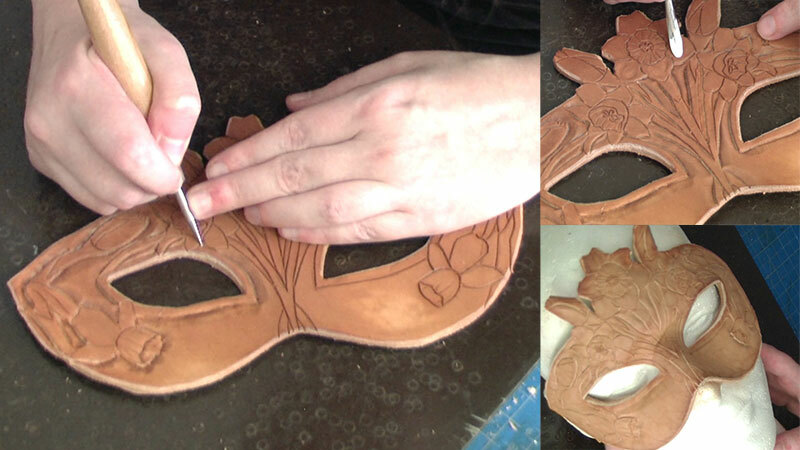 Back then, however, I hadn’t started making masks to match each Lady yet. Now that I’ve decided to challenge myself with this multimedia element, it’s time to revisit December’s themes as a mask! 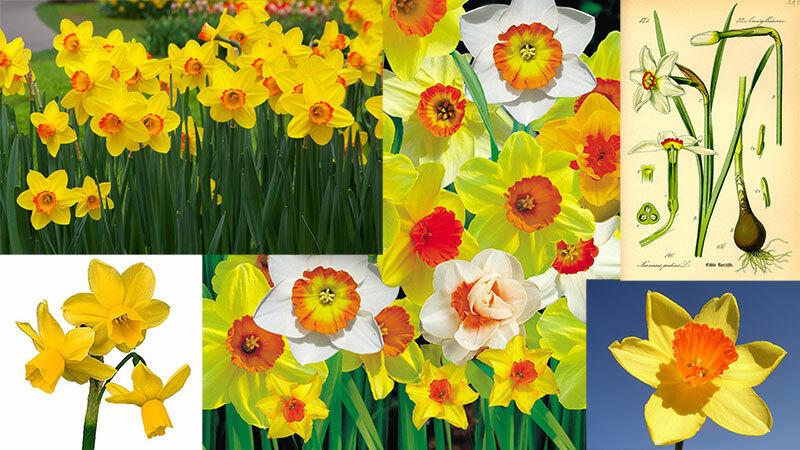 The birthstone of December is Turquoise and the flower is the white narcissus. I’ve actually done prior research into the structure of this flower for the Advent Angel piece created for my Spirits of Winter series, who was actually the prototype birthstone image I did before I switched to the Ladies of the Months’ rectangular format instead. 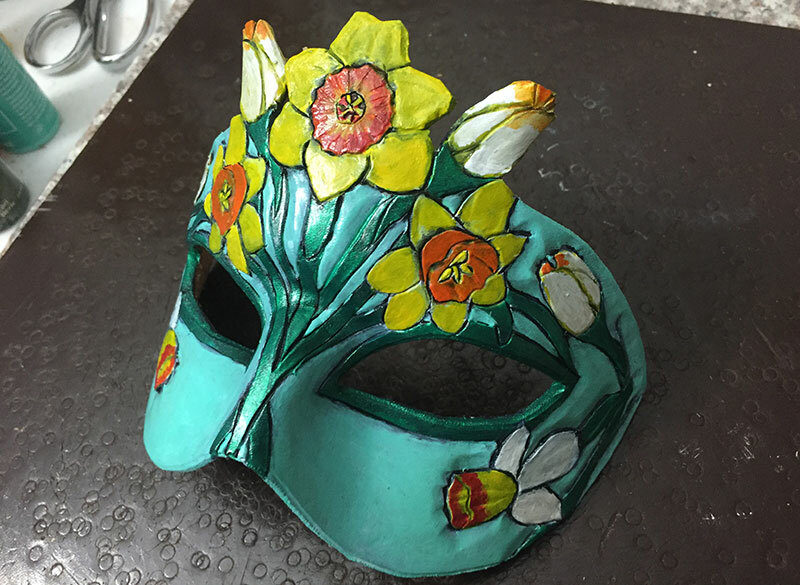 The funny thing about white narcissus is that they share a lot in common structurally with daffodils, being a variant of a similar plant, so I had some warm up with this flower already thanks to March’s mask and the aforementioned Advent Angel. I love the way the corona of petals overlap to give this flower its unique shape! I decided to go with the more rounded star-shaped for this mask, since I like the simplicity of it, which is much easier to carve. I was actually pretty happy with my first try at this design. 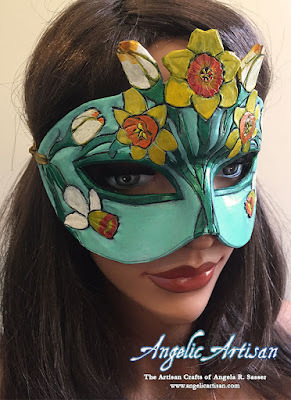 The flowers have elegant sweeping stem structures that fill up the space nicely with the bunches of blooms in the middle, crowning the mask in a balanced way. 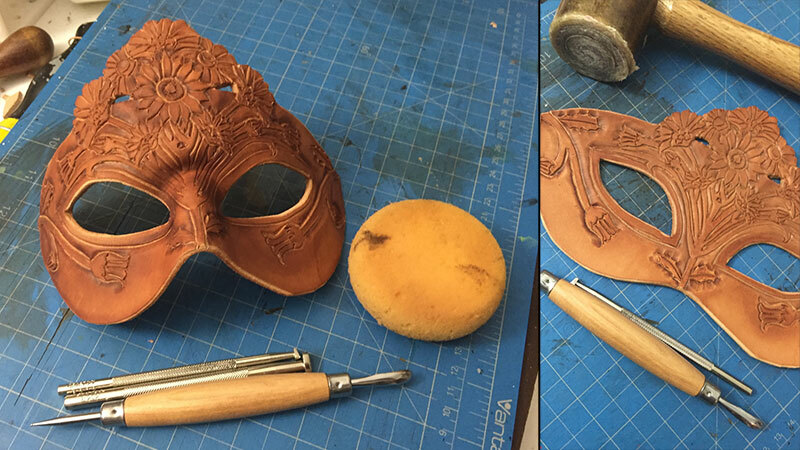 Here are some shots of the mask during the tooling phase and after it was baked and hardened. I’ve tried something different with the tooling for this flower by adding many thin lines in the petals with a stylus to give it a delicate textured feel. 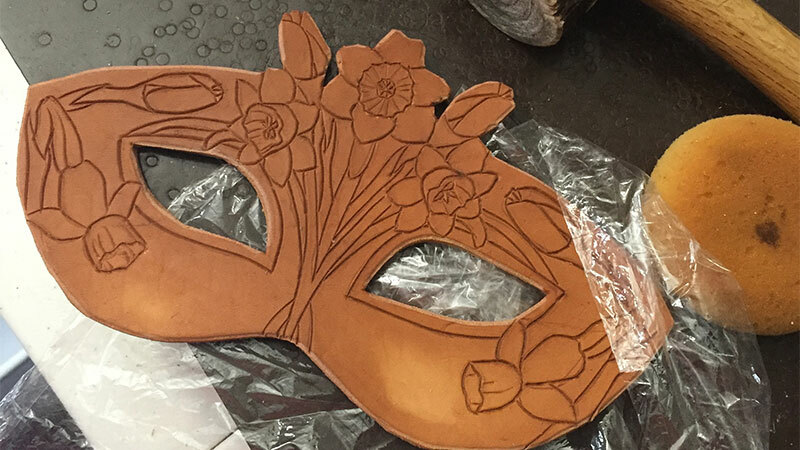 This is actually the same technique I’ve used to add texture to butterfly wings in leather. 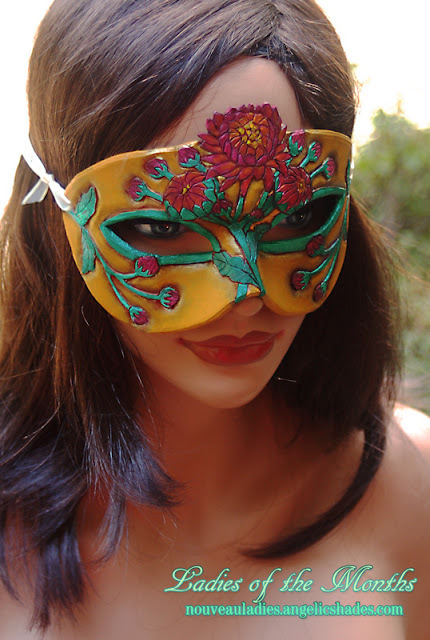 May's mask marks a shift from the previous masks, which have been a lot more colorful. With the birthstone being Emerald and the stems being green, it was going to be an interesting challenge! I gather my references on Pinterest where I find multiple views of the flower from the side and front. I also wanted to find reference of the bright colored seeds, which I knew would add a burst of color to this monochromatic mask. 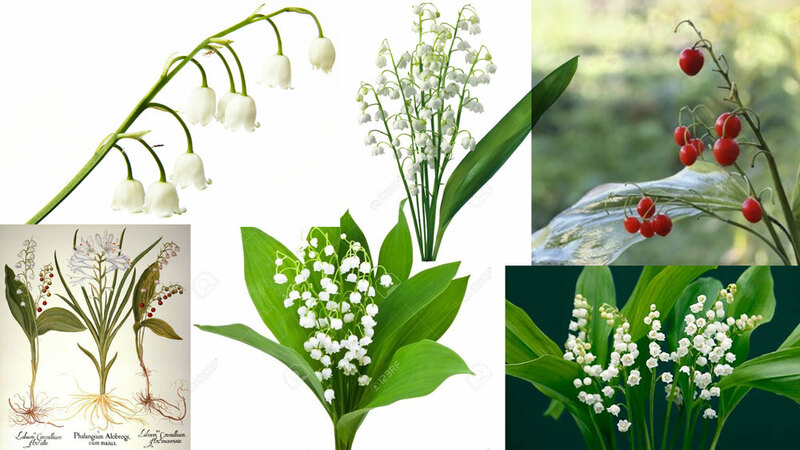 Flower Note: All parts of the Lily of the Valley are extremely poisonous! On the other hand, the red berries of the Hawthorne flower, the other flower for May, can be used for medicinal purposes. Life and death berries! I love that. 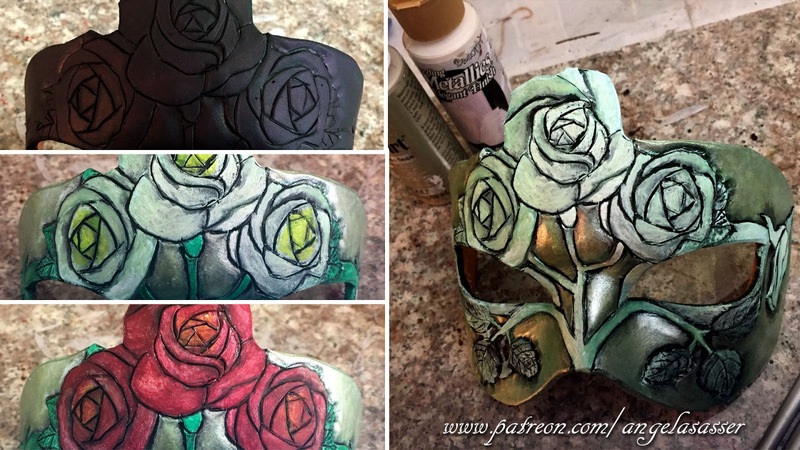 I tried out a couple of layout variations and decided I liked the more symmetrical one so I could show different angles of the blooms for more visual interest throughout the mask. Here are a few peeks at the mask in progress! 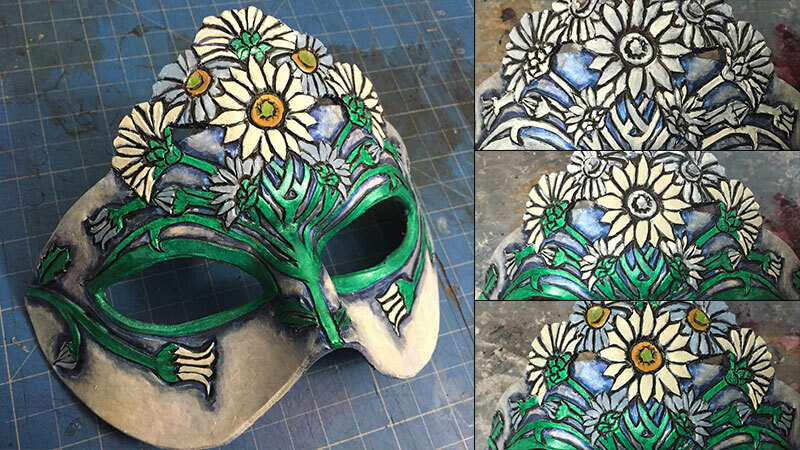 By the end, I decided on a dark green to help set off the bright green stems and white blossoms, which resulted in a much darker mask than usual. 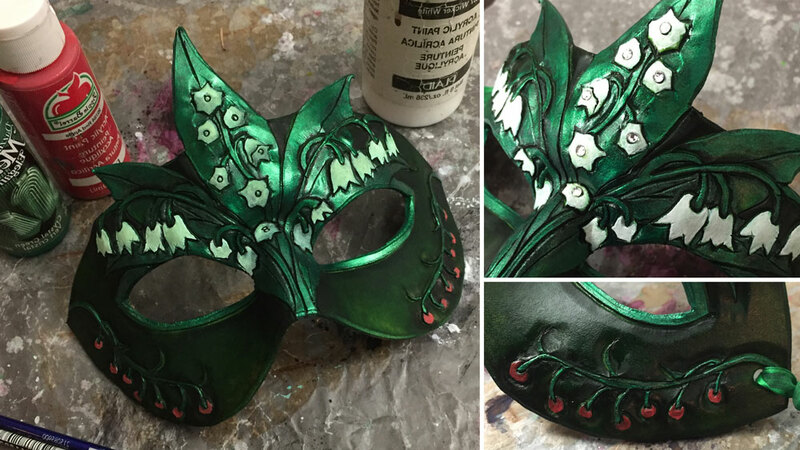 I brought a little subtle shine back to the mask by adding a few tiny rhinestones in key places. 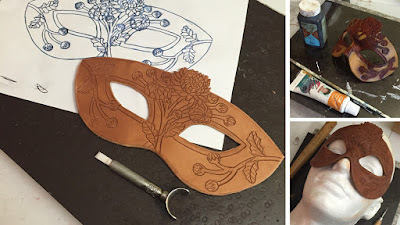 In the end, I think this mask is one of the most elegant masks yet! 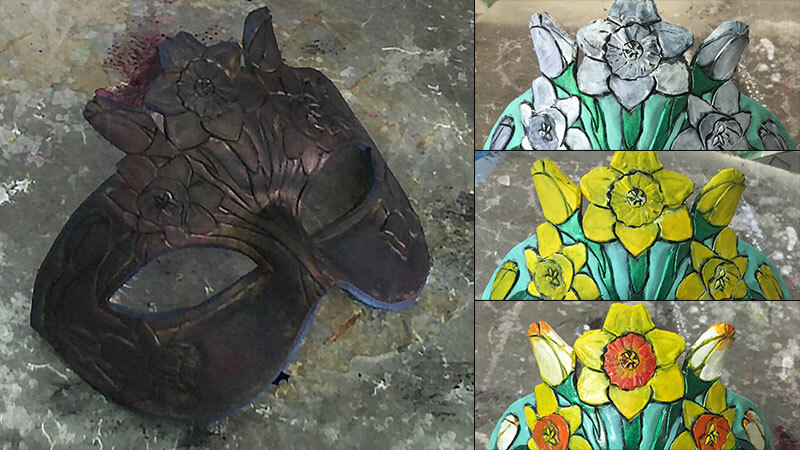 With February's mask fresh in my mind, March's mask presented a unique challenge with a completely different flower and color scheme. 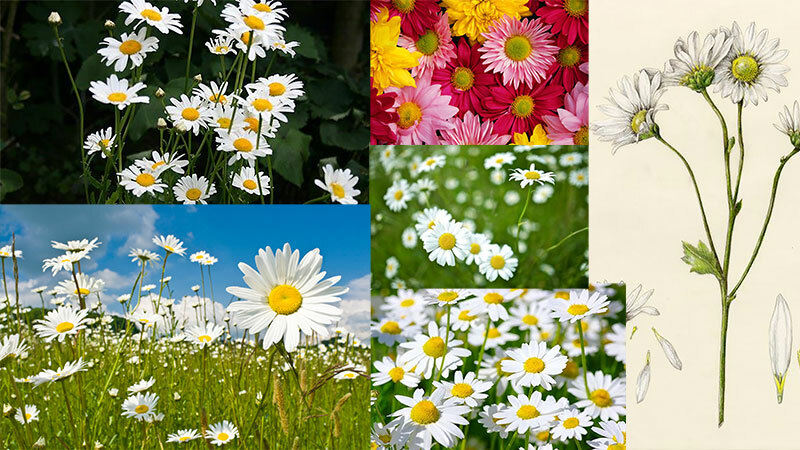 I always begin by gathering references of different angles of the flowers, usually photos and botanical drawings to inform the shape of the flower. Using January's mask as a base, I arranged my main blossom elements on a template in Photoshop. This time, I had two different alternate arrangements and decided to go with the more symmetrical layout. I liked that blossoms on the side provide more interesting variations of shapes and also take up more space, especially when the stems are added into the design later. 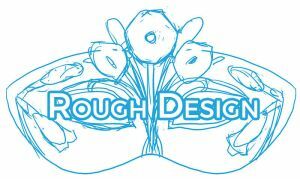 After the stems are added, the design looks something like the rough design below. Then it was a matter of cleaning up the lines, figuring out where I want my lines to overlap each other, and printing them out for transfer. Want to read these Design Diaries before everyone else? 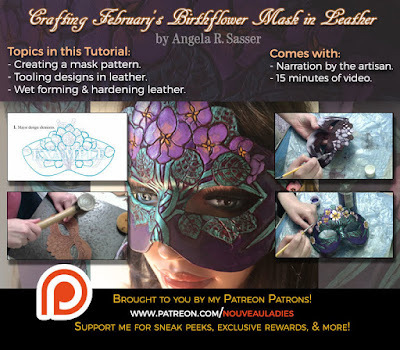 Consider pledging to my Ladies of the Months Patreon. You'll get early sneak peeks, plus other exclusive Rewards! March's mask is available at my Etsy shop. Because this is such an intense mask, only 10 of them will ever be made!